Getting off the plane at Gwadar airport, I was holding Nassim Nicholas Taleb’s book: The Skin in the Game. The book caught the eye of the person next to me and he asked: “Are you a finance professional?” I told him that being an economist, I do have interest in finance. He was a tall and well-dressed gentleman who introduced himself as a former international banker having worked in many countries and now planning to raise investment for a few development projects in Gwadar. I was expecting encounters only with property dealers, not bankers in Gwadar. The refreshing encounter, to my surprise, was the start of my eventful trip in Gwadar city. From the entrance of Gwadar Port — in the beautiful backdrop of the fluttering flags of red and green—one can observe that the work on the port and free zone is advancing rapidly. Things are lagging behind, however, on the city-side. Some confusion has emanated from the decision to revise the master plan. But other municipal services are also in bad shape. Efforts on water and electricity are still under way and it will take some time for them to materialise. It is hoped that a desalination plant will start fulfilling water need in 6-8 months and it will usher a new era of development in Gwadar. The local residents, Gwadaris, have family roots in Oman and Iran and they frequently travel to these countries. I asked my driver: “What difference do you see between the cities of Chabahar and Gwadar?” He immediately responded ‘cleanliness’. “Chabahar is a clean city and Gwadar is not!”, he said. This was evident across the old town of Gwadar. While interacting with boat-makers, fishermen, and students on the Gwadar Campus of Turbat University it was found that local people can see the opportunities arriving in Gwadar, but they were still skeptical of the idea of getting a fair share. A lot of work is needed in this direction. During discussions with students and faculty of Gwadar campus, they were open to new ideas, opportunities and collaborations. We discussed to focus on hospitality training, both for jobs and entrepreneurship, and to connect Gwadar’s youth to other big cities like Quetta, Karachi, Lahore and Islamabad, especially with the entrepreneurs. I encouraged them to interact with the newly established National Incubation Centres in Karachi and Quetta. The students also informed about their candid discussions with Interior Minister Ahsan Iqbal about the future of Gwadar during his visit to the university. Such interactions by senior policymakers and politicians with the local people can certainly make a difference. Gwadaris were neglected throughout the previous century until the start of work on Gwadar port. Due to historical deprivations, they are still not fully certain about the prosperous future that is now in front of them. Many Gwadaris admire General Musharraf for constructing the road network in this area which opened many horizons for them. Now there are other positive developments in the areas of education and health. A military-operated civil hospital has for the first time provided primary healthcare at the doorstep of Gwadar. Earlier they used to travel to Karachi even for basic health services and many of the patients could not survive during this journey. It is still hard to get civilian doctors to serve in Gwadar, but the military has bridged this gap. Both consultation and medicines are totally free for the people of Gwadar. The Pakistan Army also provides an air ambulance service for critical patients to shift them to Karachi. It was encouraging to note that both the Gwadar Port Authority and the Gwadar Development Authority were being headed by the best available human resource in the province. However, there are many institutional and legal complications due to multiplicity of government organisations operating in the city which needs to be resolved to improve the governance of the city. My research on Institutional and Urban Design of Gwadar, sponsored by the International Growth Centre, is focused on how to improve governance of Gwadar city to make it a thriving business hub. This research is based on, among others, review of international cases of success and failure of new economic and port cities. The research highlights that it is of utmost importance to design a robust city governance system for Gwadar which should be self-sustainable in revenue collection and decision-making for the prosperity and competitiveness of the city. Coming back to The Skin in the Game, I would like to share my brief discussions with two investors in Gwadar. One of them was developing a luxury resort in Gwadar and he was forthcoming to the idea that businessmen should contribute to the education and welfare of local communities. The other one was just a real-estate investor. He said, “I don’t care what is happening in the city. I am here to make money from speculation and that’s all”. This shows that there should be a clear policy to discourage the real-estate buyers who do not develop land in the prescribed time limit. A lot of harm has already been done by promoting real estate speculation. Such short-term investors have bought land from Pasni to Jewani to Turbat in a bid to gain hefty profits through speculation. The Gwadaris residing in the old city (between the Marine Drive and East Bay Expressway) will have to be relocated in order to expand the port operations. But it is certainly a challenging task to ensure smooth displacement and local residents’ integration in the new developments. Similarly, the proposed university of Gwadar may also not get land in the city (and it may be established a bit far from the city) that will certainly affect the access to higher education in the city. It is very important that decisions for Gwadar are taken in consultation with the people who have their “skin in the game”: Gwadar’s local population and the aspiring entrepreneurs who are flocking to Gwadar to seize the opportunities. Why is it important to emphasise skin in the game is explained well by Taleb himself in his book; “Things designed by people without skin in the game tend to grow in complication (before their final collapse)”. Gwadar can’t afford it! Contrary to perception, the law-enforcement agencies have maintained security in Gwadar and it is the best place to see the clean emerald water. The beaches are quite serene and clean. One day these will become a top tourist attraction. I travelled by air but locals advise to experience the road travel from Karachi to Gwadar on the Coastal Highway as it is full of scenic and natural beauty. 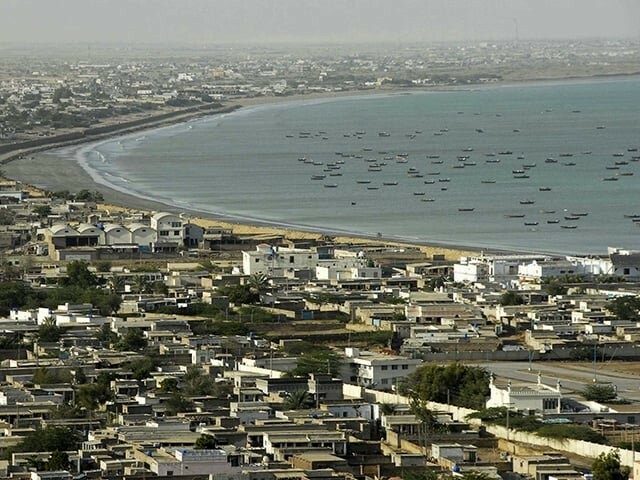 Students, professionals, businessmen and civil society activists should visit Gwadar both for tourism and to participate in the historic development in the country. Early morning on my last day in Gwadar, as I jogged on the south avenue on the top of Koh-e-Batil (or commonly called hammer-head) greeted by the endless expanse of emerald green water, I watched the sun rise, and despite odds, I hoped that it was not just a new day but the dawn of a new age of fortune and prosperity — for Gwadar, Balochistan and Pakistan.